What does the consumer get when her or she enters the words “Grand Theft Auto” into the App Store’s search engine? Well, the first few results look promising enough: Grand Theft Auto: San Andreas, Grand Theft Auto: Vice City, Grand Theft Auto III, etc. But after that, there are still rows and rows of search results. Where do those links lead? As it happens, they lead to a plethora of shameless, inept, and incredibly entertaining Grand Theft Auto knockoffs. 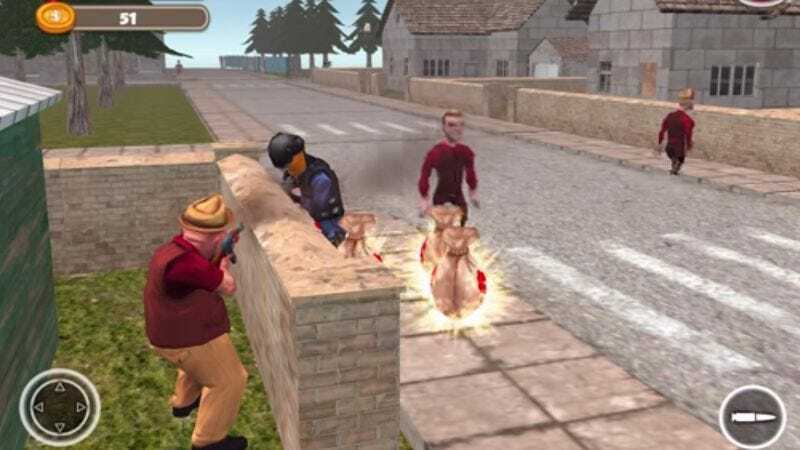 Games vlogger Jerma 985, whose motto is “Video games are fun,” decided to venture way beyond San Andreas and explore such shameless GTA wannabes as Grab The Auto V and Gangster Town to see how they hold up to the Let’s Play treatment. The games, not surprisingly, are marked by wonky cameras, wonkier controls, long loading times, primeval graphics, and any semblance of purpose. “Do I have a mission to do?” Jerma wonders aloud early in the proceedings as he drives aimlessly through a city which downloads before his very eyes, crudely rendered trees and buildings willing themselves into existence, 15 feet at a time. The player deliberately driving into a building which literally absorbs his car before casting it into a featureless blue void, where it free falls into nothingness, presumably forever. A pesky, seemingly self-driving car painted a hideous shade of fluorescent green.